This month's Buckhead neighborhood profile is Brookwood Hills. Developed in the early 1920s, historic Brookwood Hills is located near the dividing line between Buckhead and Midtown, just north of the "Brookwood Split". Like many of the neighborhoods in this area, The Battle of Peachtree Creek occurred on part of the grounds of Brookwood Hills. The area was later named after the estate of Joseph and Emma Thompson, known as "Brookwood", which was located near where Brookwood Station is today. 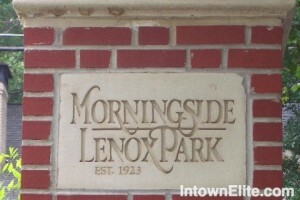 This month, we're featuring with the Intown Atlanta neighborhood of Morningside/Lenox Park, most commonly referred to as "Mornginside". Morningside is one of Intown Atlanta's most beautiful neighborhoods with curving tree-lined roads, multiple parks and well-kept homes. The neighborhood is highly-sought after not only for it's beauty and convenient location, but also for it's school district. Most childern in Morningside go to Moringside Elementary, an award-winning public school. The homes in Morningside are bursting with character, with a various styles represented. The neighborhood boasts one of the city's largest collections of Tudor Revival style homes (along with Druid Hills), as well as numerous Spanish and Mediterranean style homes. In addition to the large number of 1920s to 1940s homes, Morningside also has some stunning Contemporary homes, and mid-century ranches, the latter of which are common in the Johnson Estates and Noble Park areas.